Transferring one of the tendons that pulls the toe up into the midfoot, so that it is not excessively pulling up the big toe joint but can still help pull the foot up. The indication for this surgery is a painful clawing of the big toe. 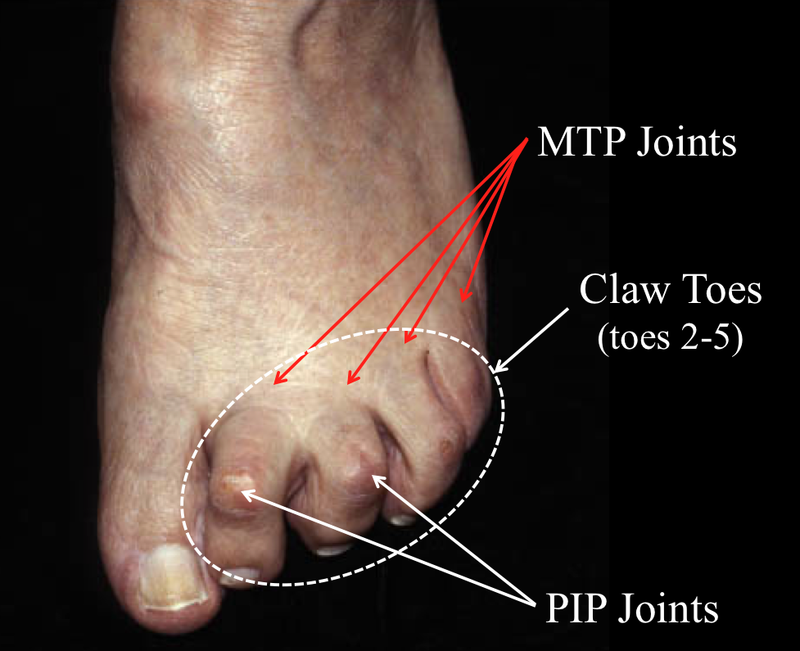 This condition tends to occur in patients who have Charcot-Marie-Tooth or a similar condition that causes high arched feet. A Jones procedure is often performed as part of a larger operation. Big Toe Tendon Transfer (Flexor Hallucis Longus Transfer) The tendon that pulls the big toe down (flexor hallucis longus) is transferred to the base of the bone of the great toe (proximal phalanx). This is usually done through an incision on the side of the big toe. This tendon is identified and then cut near where it inserts in the bone towards the tip of the toe. The tendon is then moved along the side of the big toe to the top of the toe. It may also be transferred through a hole drilled in the bone at the base of the great toe (proximal phalanx). Securing it there allows it to pull the whole toe down, where before it was pulling down just the last knuckle by itself (contributing to the claw toe). Interphalangeal Joint Fusion of the Great Toe. The second procedure involves a fusion of the small joint in the toe. This joint can be approached through the same incision that was made to harvest the tendon. The joint is identified. The cartilage is removed. The joint is then fused with a screw and/or wires. Extensor hallucis longus tendon transfer to foot. The tendon that pulls the big toe up (extensor hallucis longus) is released, often through the same incision. It is then transferred up into the midfoot. The purpose of this is to decrease the force pulling the toe upwards, but still allow this muscle to work in the foot, as it is important to continue to have this force pulling the foot itself up. The recovery from a Jones procedure is often dictated by other procedures, such as fusion in the midfoot or hindfoot that may have a more prolonged recovery time. An isolated Jones procedure typically requires six weeks to allow the bone to heal; and during that time, partial or full weight-bearing may be possible through to heel. It is important that the foot be elevated to minimize swelling and that appropriate pain control is instituted. Nonunion of the interphalangeal joint. Malunion of the fusion (interphalangeal joint) if this heals in an abnormal position. Failure of the tendon transfers to take hold with resulting dysfunction and/or poor position.